Joey Pepperoni is no stranger to me as I've worked with Kettle Foods Corporation before and handled this pizzeria for a short while. I still remember going crazy over its delectable pesto pasta and how I make sure I dine there for lunch every payday. 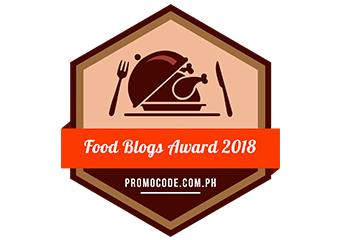 And years and other pesto dishes later, Joey Pepperoni's version still delights my taste buds. 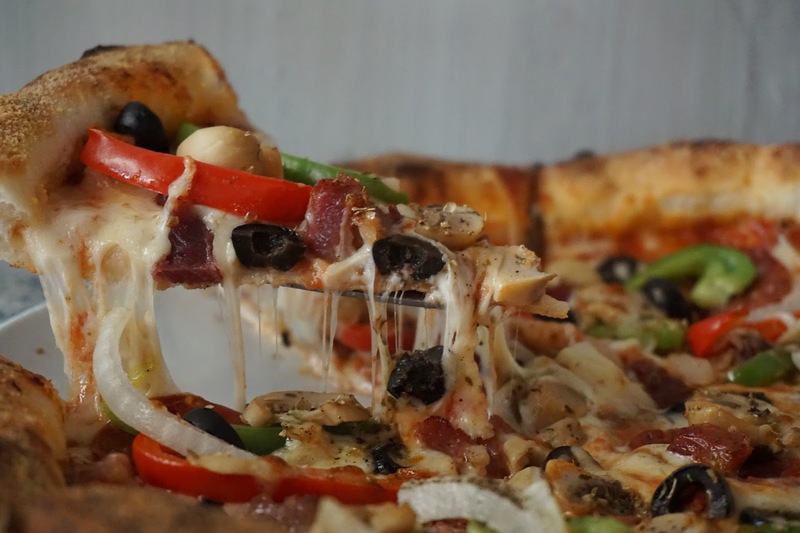 This local pizzeria rebranded a few months ago and added new product offerings. 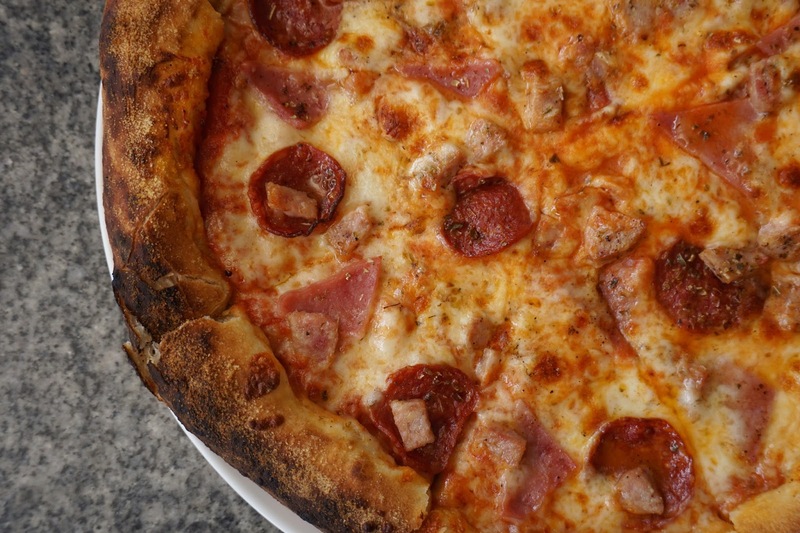 Shifting to brick oven also changed how Joey Pepperoni makes its pizza. Now with a puffier and thicker crust, it made carb lovers twirl with happiness. 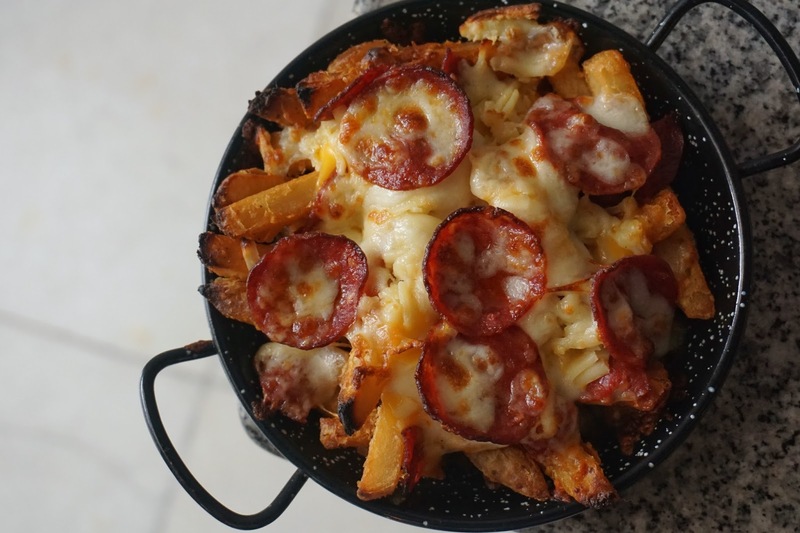 During our visit, we feasted on Pepperoni Fries (PHP170), Mozzarella Bites (PHP195), Joey's Supreme (PHP210, 8" | PHP440, 12"), Bianca (PHP195, 8" | PHP390, 12"), Meaty Legend (PHP210, 8" | PHP450, 12"), Rosemary Chicken (PHP240), Chicken Parmigiana (PHP235), Pesto Pasta (PHP165), Banana Nutella Pizza (PHP140). 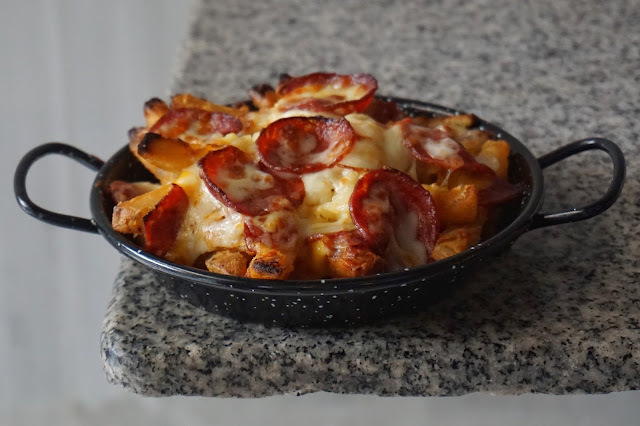 The Pepperoni Fries were so good! It was so cheesy and the pepperoni slices added that delightful meaty flavor to the dish. I could have finished the whole dish if only there were not a lot of dishes for us to try and if I was not competing with other foodies who fell head over tummies with this smacktacular dish. The Mozzarella Bites were good too. The batter was crunchy and the mozzarella inside was soft and gooey. The dish was well complemented by the marinara sauce it came with. 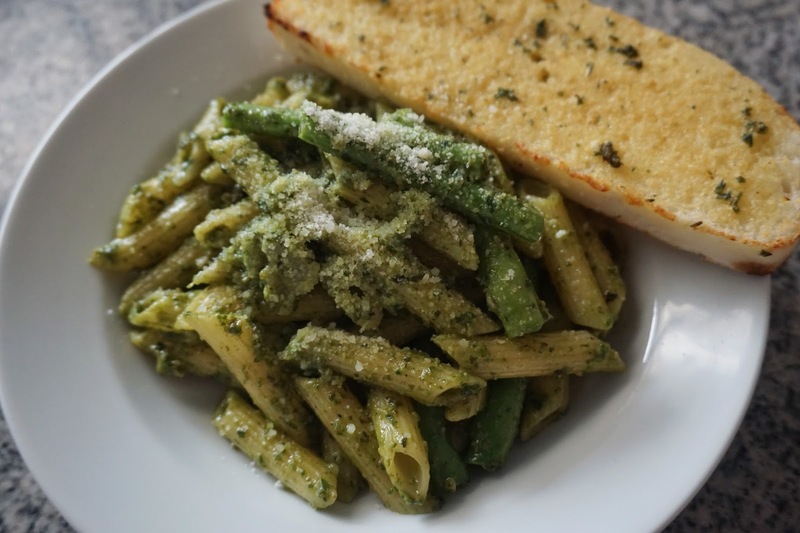 It was no surprise for the pesto pasta to be a hit during our meal. Everyone liked the herby taste of the green pasta. 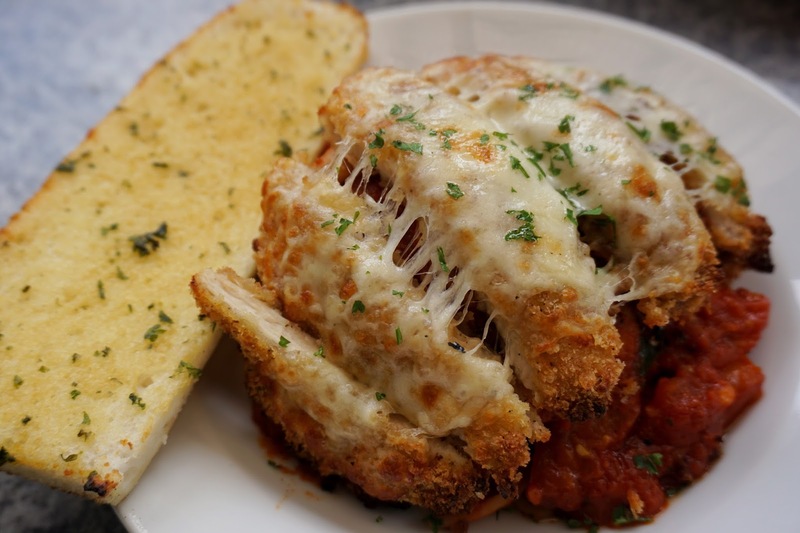 But if you want something heavier, you might want to go with chicken parmigiana which comes with a huge slab of breaded chicken fillet topped with cheese. It may be a bit too tangy for those who are used to sweet red sauce. But it would surely delight anyone who prefer the Italian version. For the pizzas, everyone liked Bianca the best. The blend of mozzarella, white cheese, and bleu cheese with anchovies, garlic and arugula made this pizza a winner! It was flavorful yet not overwhelming. And the fact that it was topped with arugula made me feel that I was eating something healthy. Joey's Supreme was pretty good as well. Its generous serving of mozzarella cheese, cheddar, pepperoni, bacon strips, mushroom, green and red bell pepper, onions and black olives made this dish value for money. Two slices of this could be enough to fill you up. Meat lovers would enjoy Meaty Legend as it is topped with pepperoni, Italian sausage, bacon strips, and of course, mozzarella cheese. This is perfect for those who avoid greens. 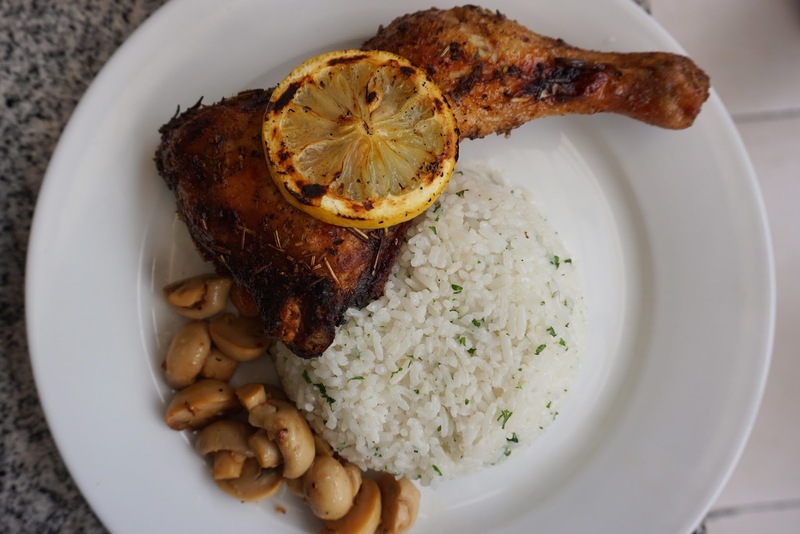 I also liked the beautifully grilled and baked rosemary chicken. It had a lovely garlicky and tangy taste which was well complemented by rosemary. I wouldn't mind having this for lunch for days! The Banana Nutella Pizza was quite hard to slice. But I guess it was made like that for you to avoid sharing it with others. I wouldn't mind finishing one whole of this as it was so good! The chewy crust topped with banana, cinnamon and Nutella was bliss. Overall, it was a lovely meal. I'd definitely swing by again for Bianca, Rosemary Chicken, Pepperoni Fries and my all time favorite, Pesto Pasta. Joey Pepperoni is located at Ground Floor, RFM Corporate Center, Pioneer corner Sheridan Streets, Mandaluyong City.